At 18 years of age and just 165 cms tall, Monique Conti has already distinguished herself in two sporting realms. It didn’t occur to her she was good, she tells Jack Banister. This girl just wanted to have fun. “On the court, I never realise how short I am,” says Monique Conti. The 18-year-old basketballer and footballer is 165-centimetres tall. She’s the shortest player on the roster of her WNBL side, the Melbourne Boomers. Liz Cambage, the club’s tallest player, stands at 204-centimetres. After signing at 16, Conti won the WNBL’s Rising Star award in her first season. In her second, which finished in January 2018, the point guard helped the Boomers to the WNBL finals series against Townsville. They lost that series two games to one. 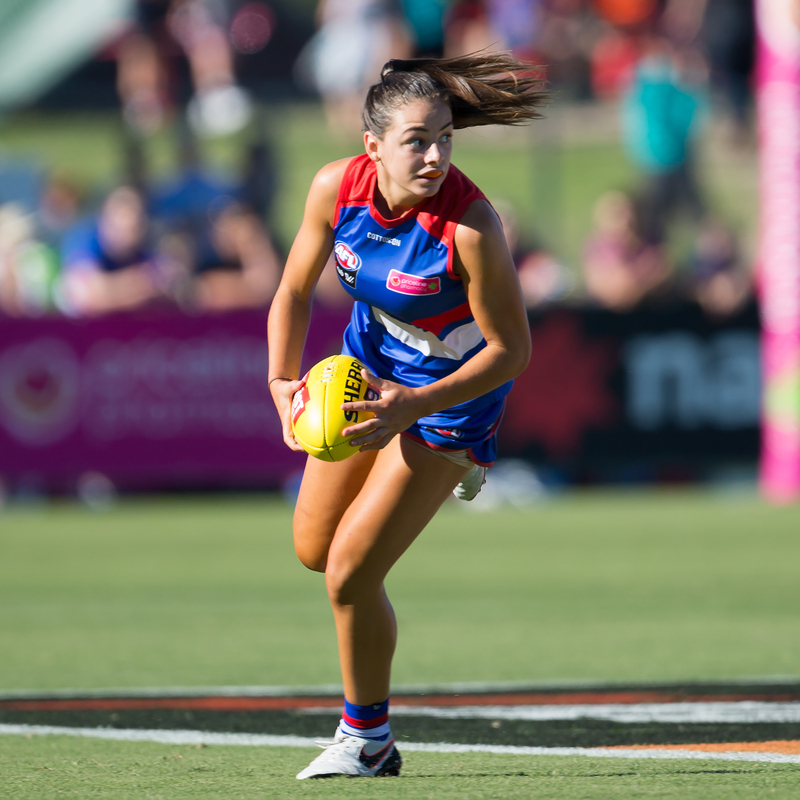 Less than three weeks later, she made her AFLW debut for the Western Bulldogs, playing as a half-forward flanker. In her fourth game, she was nominated for the AFLW’s Rising Star award. This afternoon, she’ll run out in the AFLW Grand Final at Ikon Park. Though her achievements put her among the elite players in Australia in two codes, Conti says that the thought that she was gifted never occurred to her as a kid. She took up basketball at five, and football at ten. Her parents, Simone and Sam, are sporty, and wanted her to play. Her older brother, Nathan, 23, was her main competition. Her love of football raised eyebrows among some of her basketball coaches. “At the time, it wasn’t like there was a pathway (in footy). It was a ‘don’t get injured’ type thing. But you can get injured playing both, can’t you? So, I just kept playing and it’s not that I didn’t listen, but I just ignored the fact that people were saying, ‘you might get hurt, your load’s too much’. She never seriously considered giving up either sport as a junior. “I just couldn’t stop playing one,” she says. Conti started to make representative teams in both, until in 2015, she missed the Vic Metro U18s basketball side. The setback put her on a path that eventually led her into the WNBL and the AFLW. Her coaches explained that she’d missed out because of her size. She wasn’t strong enough, or wide enough, to compete with bigger bodies. As a December baby, Conti was as young as anyone available for selection. She still had two more years in the age group, but she refused to make excuses. “I hated being knocked back,” she says. She went to the physical education teachers at her school, Maribyrnong Secondary College, and told them she needed to put on muscle. They gave her a weights program, and she set about adding size to her slender frame. When selections came around again in 2016, Conti was ready. She was picked. Her Vic Metro team went and won the gold medal. Conti starred, and was invited to an Australian camp for the first time. The opportunity to represent her country at the U17 FIBA World Championships in Spain was on the table. The only problem was that the camp clashed with the U18 national football championships. For the first time, Conti had to make a choice. She spoke to her Vic Metro footy coach, Chyloe Kurdas, who encouraged her to go to the basketball camp. Ultimately, Conti knew that she had another year to play U18s footy, but only one shot at representing her country in basketball at U17 level. She went to the camp, made the team, and then went to the tournament in Spain. Playing at point guard, Conti helped Australia to its first semi-final appearance at the event. In that semi-final, they beat the favourites, the USA, who had never lost a game at the tournament. Then they drubbed Italy to take gold. In the end, Conti reflects that the setback in 2015 made the success “a lot more special”. She was named in the tournament’s All Star Five team, an achievement that placed her as one of the top five U17 basketball prospects in the world. Fitter and stronger than she’d ever been, Conti got back to Australia and found that Guy Molloy, the coach of the Melbourne Boomers, wanted to chat. In a whirlwind year, Conti went from being told she was too small for the Vic Metro U18s basketball team, to holding a position on a WNBL roster alongside Cambage. Signing the four-year deal opened the door for Conti to play AFLW, but it meant giving up on another childhood dream. Conti had sat the dreaded SATs. She’d done everything she needed to do to make her American dream a reality. Giving it up took time. The Boomers are aligned with Deakin University, meaning Conti could choose the WNBL without sacrificing her education or her footy. In the space of couple of weeks in early 2018, she started her business degree, and her AFLW career. Pushing herself to succeed in both sports meant she had to make sacrifices throughout high school. “I grew up always having to miss out on the Saturday night parties,” she says, rolling her eyes. “I still don’t have a social life,” she laughs. Conti sees no reasons why she can’t keep playing both basketball and football throughout her career. She calls it a “love triangle”, and takes inspiration from other cross-coders, especially Erin Phillips (basketball/football) and Ellyse Perry (cricket/soccer). She feels the sports complement one another. There’s an array of current and former basketballers in the AFLW, including 2016 MVP Erin Phillips, Collingwood’s first pick in 2017, Chloe Molloy, and Melbourne player Tegan Cunningham. Conti says playing as a point guard is like being “the coach on the court”. Townsville player Batkovic won the MVP in the WNBL’s grand final series. She’s 193-centimetres tall. “You learn to draw her and then dish to someone like Liz (Cambage),” Conti says. Before the AFLW Pride Game, she had to provide five songs for her pre-game playlist, which the Bulldogs posted via their Instagram page. One of the tracks she chose was Tiny Dancer by Elton John. A metaphor? “It’s actually of my Dad’s favourite songs. I chucked it in to make him happy. He begs me to put it on when we’re in the car,” she explains. Conti is short, and her footwork is balletic, but that doesn’t make her tiny. Small can be tiny, and small can be powerful. Monique Conti is proof.